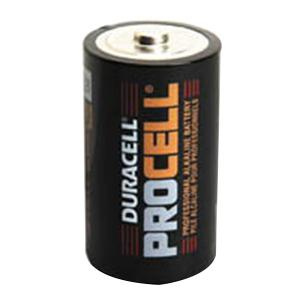 Duracell Procell® Non-rechargeable battery has capacity of 8300 mAh and has nominal voltage rating of 1.5-Volts. It has alkaline-manganese dioxide chemical system. Size C battery measures 1.03-Inch Dia x 1.96-Inch. Flat terminals terminal connection battery withstands temperature rating of -20 to 54 deg C. Battery is suitable for flashlights, radios and tape recorder. Battery meets IEC LR14 standards.